Sometimes the truth hits you like a ton of bricks. That’s what happened with these almonds. I had been buying their equivalent from Trader Joe’s and consuming each $5 package within a few days. To say the least, they’re addicting. Each one is like a meal – sweet, salty, savory and healthy, all wrapped up in a neat little package. But the ephinany hit when I stepped into my kitchen and noticed the large bag of local almonds, ridiculous amounts of dark chocolate, and large jugs of turbinado sugar and sea salt in the cabinet. Considering Trader Joe’s sells a 72% superior-quality dark chocolate bar that is imported from Belgium and costs under $5, there was no reason not to make these myself. These turned out with a thinner chocolate shell than their storebought counterparts partially because of my impatience, but on the plus side I got more almonds out of it (~150). 1. Place chocolate in a medium-sized microwave-safe bowl. Microwave on a medium power level, checking and stirring every 30 seconds, until it is just melted. If the liquid chocolate is hot and very thin, let it cool for a few minutes until it thickens. 2. Line a baking sheet with tin foil. Toss about half of the almonds in the bowl and mix them with a small spoon to coat with chocolate. Take them out with the spoon and place one at a time on the baking sheet as shown above. Repeat the process with the remaining almonds until you’ve expended your supply of chocolate. 3. Mix the salt and sugar in a small dish and sprinkle over the top of the almonds. Freeze the tray for about 30 minutes and then let sit on the counter for another 30 minutes. Place in a sealed container and store at room temperature. If they aren’t fully dry, you can place the container in the refrigerator for an additional hour. * Approximately 2/3 of the fat is from the almonds, the other 1/3 is from the chocolate. Here’s a little comparison of the before and after cooling pictures of the almonds. The fact that they were taken from near the same perspective was on accident but pretty nifty eh? Very interesting, wondering how dominant the salt would be in the dark chocolate background. Those almonds look spectacular – they're practically glistening with the salt & sugar! That looks incredible! I’ve seen those at Trader Joe’s too! That looks awesome, and dangerous! I don’t think I could keep to one serving at a time! Do you need my address so you can send me my almonds? You didn’t? You know how weak I am in the face of temptation. Oh wait, I can do 130 calories for 10. Phew! I love this, Nick! Sweet and salty! It doesn’t get any better! I am loving this little treat! Looks easy and utterly delicious! Hehe I love your little anecdotes. Those chocolate almonds look so pretty! They would be so good to have in bowls at a party. Katrina, I would say about 10. Actually since you asked, I edited the post and added nutritional information for 10 almonds. Super healthy! Veggiegirl, Glistening and glowing with tastiness! They are outstanding and the candle story still haunts me of the prize that could-have-been. Biz, The first round may not have been as good as Trader Joe’s because the chocolate coating wasn’t very thick but if you have some patience to wait for the chocolate to thicken before dunking they will be better! Jennifer, It’s tough, but I never take the box out of the cabinet. Every time I open the cabinet though, I take 1-3 almonds. It’s not that bad though, I usually have anywhere between 3 and 15 almonds per day. Michelle Ann, I should start taking orders, $5 a box! ttfn300, I always find some things to be dangerous to keep around, specifically ice cream because I’ll just take it out of the freezer and eat from the carton, but with these I never do that. Somehow, they have so much flavor that you need to savor each one and honestly one is enough. Grace, I know! They really are like perfectly balanced little meals. Meg, It’s the salt that makes all the difference. My Sweet & Saucy, Tis. Katie, Haha, these are the perfect date! OH! MY! GOD! These look amazing and seriously, they are the worlds most perfect food! 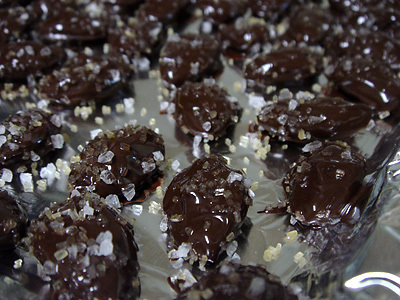 It looks like the sea salt and turbinado sugar provide the perfect crunchy texture! I love salty and sweet together, yours look so much better than Trader Joe’s! Carol, I know! And of course gluten-free and vegan too! Hillary, Yes, the texture along with the flavor of those crystals is just incredible. Reeni, Thanks! Maybe I should market them to TJ’s…. AForkful, Hey, nothing wrong with some dark chocolate for your dose of antioxidants. And it’s really not all that much chocolate in a handful of them (or forkful perhaps). They look fantastic! Salt and sweet is a disastrously good combination. My version of these – as I’m not allowed chocolate or sugar at the moment – is slow roasted almonds with garlic, honey and spanish smoked pimenton, they’re addictive I tell you! Oh, yeah – forgot to add that I’m with Forkful on this one. With the amount of salt you got on those babies – even 10 a day is a one way ticket to hypertension…. but you’ve gotta go somehow and I can’t imagine a more delicious poison. What? No peanut butter? I’ve been out of the loop lately — what’s happened to you, Nick? Not that these little treats don’t look incredibly good, but still, I wondered if I was at the right blog. Funny, my current post has peanuts in it and yours doesn’t! :-) I’m not complaining though, as I’m a huge fan of almonds and dark chocolate. P.S. Good story about the candles. Wow – these are almost too pretty to eat! I would have great difficulty eating 10 of these almonds :) Currently I am addicted to Trader Joe's Dark Chocolate Covered Edamame & it's hard to control myself!! Wow! These look amazing! I know I would love them, as I’m crazy about any kind of sweet/salty combination. YUM. Oooh, very interesting treat! Pretty too! The Trader Joe’s Pound Plus Bars are an incredible value for some very high grade chocolate. I not only use the milk and dark for a million different things, but I munch on a milk chocolate bar every day. I normally eat 5-8 small squares a day. After spending half my career in the chocolate industry, I know that Trader Joe’s Pound Plus bars are a super alternative to the much higher priced artisanal chocolate offerings out there. Naomi, I gotta try your version of these almonds they sound great, plus they don’t have the high amount of salt that these ones do. Chou, Haha the candles burned as expected really, they just dripped down the sides, but since it was sloped they dripped slower…I like the cayenne idea..
Melissa, Hah, well not EVERYTHING on my site has peanut butter. But I figure anything with nuts in general is close enough, although I probably won’t ever use a different nut butter. Maureen, I love those edamame too but these almonds at Trader Joe’s are probably twice as good, no joke. Jessie, I agree, it’s all about hitting multiple taste buds! Doc, I always thought it was a very high quality chocolate. I usually have about 10-20 high quality brands on hand at any time for consumption but I find myself eating the TJ’s as well, it’s good to hear (from a real chocolate guy) that my instincts were right, TJ’s makes a darn high quality chocolate. 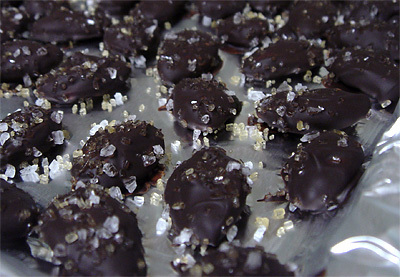 Wow, I have been looking for a simple recipe that combined chocolate and sea salt! thanks! Had some of the Trader Joe’s almonds for the first time this weekend (WOW) and was looking for a recipe. I have low blood pressure, so I have to eat more salt. Using xylitol still gives you the crunch without the carbs. A little dusting of cinnamon is delicious, too. Sure thing, I hope you enjoy it! I use cocoa powder and a little cream instead of the choco chips to make it a decent low-carb snack. But that doesn’t work to coat these almonds, right? I think the coating would dry if I let it — but I usually can’t wait that long. In your recipe, does the “t” stand for tablespoon or teaspoon? I made these for Christmas and the only thing I did differently was to toast the almonds before coating them. Makes a whole difference in taste. That’s a great idea Nancy, I’ll do that next time! Thanks for the tip!